You might say that Kevin Tobia is a Renaissance man. He graduates from Rutgers next month with degrees in philosophy, cognitive science and mathematics and is then off to the University of Oxford in England after being named one of only 15 students in the world to receive a full two-year graduate school scholarship bequeathed in the name of the founder of Atlantic Records and his wife. Tobia received the scholarship – which will cover tuition and living expenses – after being accepted into the philosophy program at Oxford. 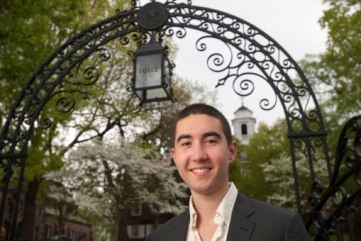 He was recognized for his academic achievements at Rutgers by a committee of Oxford’s humanities division that reviews the academic records of all those accepted into the program before making its final selection. The scholarship is named for the late music mogul Ahmet Ertegun who helped shape the careers of music legends like Ray Charles, Eric Clapton, Led Zeppelin and the Rolling Stones and his widow, Mica. “My dream is that one day, Ertegun Scholars will be leaders in every field – as historians, philosophers, as archaeologists and literary scholars, as writers and composers, as statesmen and theologians,” said Mica Ertegun, who instituted the scholarship to help provide financial support to the best humanities scholars in the world. Tobia, a classical pianist who works as a DJ in his spare time, wasn’t aware of the $26 million gift to Oxford – the biggest donation for humanities students in the university’s 900-year history. He finds it is somewhat ironic that he received the scholarship from the estate of a man whose life was centered on the music industry.